This the fourth of our OEPS forums was focussed on change. The focus was based on the feedback we had received from previous events, that the OEPS community wanted an opportunity to talk about and reflect on the changes they felt were needed at all levels and scales, from the individual to the national. I led one of the afternoon sessions, it was called “Open education and digital engagement through a widening participation lens”. When I reflected on ‘what change’ and how to put together something meaningful around big terms like Open Education, digital, and widening participation what struck me was the sense in which we often think of how they relate to each other, as enablers, as conditional statements, and as dilemmas. For example, in the widening participation world, digital technologies and assumptions about ubiquitous access and digital literacies can act as a barrier, at the same time if we are to promote social justice we need to ensure we reach into the digital world. Or we talk about (or at least used to) digital technologies as enabling OER. Our role, what we do and how we (and others) see our role, as facilitator, teacher, builder, or decision maker (all overlapping). Personal values, what I believe the value of education is, and how I think about the role of education in creating public value. In my context in eLearning the role of digital technology in open education is enabling but difficult to roll out and increase engagement. Just a small selection, but they capture the themes, a sense of interlinked nature, with one enabling but creating tensions around another. Access was prominent, of course open is about access. But we also see concerns and tensions between access to and engagement with, questions about participation and what being open does in the world. In the second exercise we started to tease out those dilemmas and tensions, again crudely I provided a set sentence as an example. Slightly over the post lunch lull at this point people were getting warmed up, the comforting hubbub of a workshop where people were thinking and talking, and the papers ended up flooded with post it notes. Change in context, self-select organisations whose values reflect your own in order to achieve the changes you want! If open education is to enable furthering the goal of the common good then the policy ‘open is not the default’ needs to change to ‘open is the default’! These are the challenges, some top down, buy in from management, open as default, stop using open as way to market “warm contacts”, start getting serious creating a culture of open (or move on as one suggests), engage proactively in digital participation for staff, the learners you do have and more broadly. Some of the things are facing in, a mix of bottom up capacity building and cultural change and top down policy (I will spare reading the post-it suggesting SFC gives more money). Others are about turning to face out, what open does to blur the boundaries between the classroom, the online and the wider community. It was all a bit rushed, and people wanted more time to talk through the ideas that were emerging, it meant I missed out the last exercise in each of the workshops. So below is the closing exercise. To close I thought I would ask you to share one of my “What ifs” And invite you to jot down some of your “what ifs” regarding digital technology, open education and widening participation. 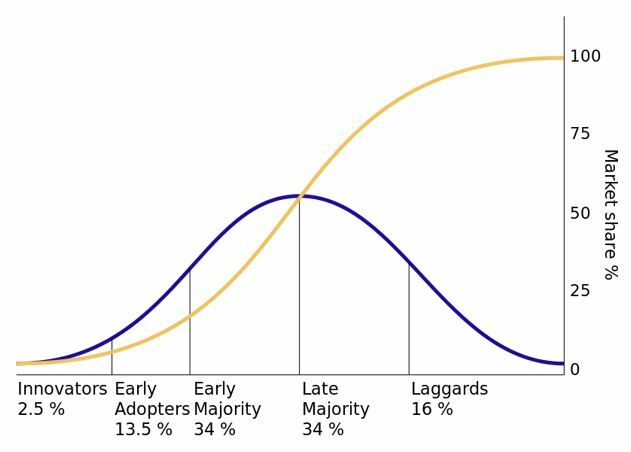 We know a little bit about innovators and early adopters, they tend to be well educated and have good incomes, they tend to be societies ‘haves’. What if I do not accept the benefits of an innovation (like free open online education materials) are not shared equally. I am not sure what the answer is to this, but sometimes you do not have answers to these “what ifs”, they simply are about thinking outside “the facts”, not accepting the context, and looking at how to drive change. I invite you to note your “what ifs” and share, and to keep thinking about this.